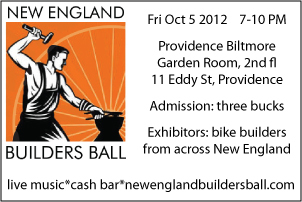 Projects » Blog Archive » The 2012 New England Builders Ball is on October 5th! « 10TH ANNIVERSARY OPEN HOUSE SUNDAY! The 2012 New England Builders Ball is on October 5th! Mark your calendars people, it’s the 2012 New England Builders Ball! That is if you want to meet a bunch of awesome framebuilders from New England. It’ll be happening right here in our hometown of Providence, RI in the beautiful Biltmore Hotel. If it’s anything like last year’s event, it’s going to be a good time. See you there! This entry was posted on Monday, September 10th, 2012 at 12:46 am	and is filed under Circle A Project. You can follow any responses to this entry through the RSS 2.0 feed. You can leave a response, or trackback from your own site.